Leonardo Plays Leonardo. Milan. Life. Nature. – is an interactive exhibition at Palazzo delle Stelline in Milan. 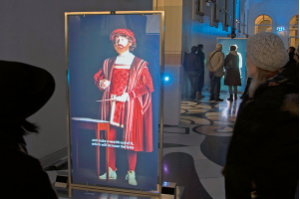 Exploiting rear-projected holographic screens, a human-sized digital Leonardo da Vinci comes back to life and tells stories about his period in Milano, his life and relationship with Nature, enacting the genius loci of the place. Developed through an iterative process of design, involving several professionals and employing open source hardware and software, the exhibition is made of three interactive installations activated by the presence of visitors and controlled thanks to gestures.